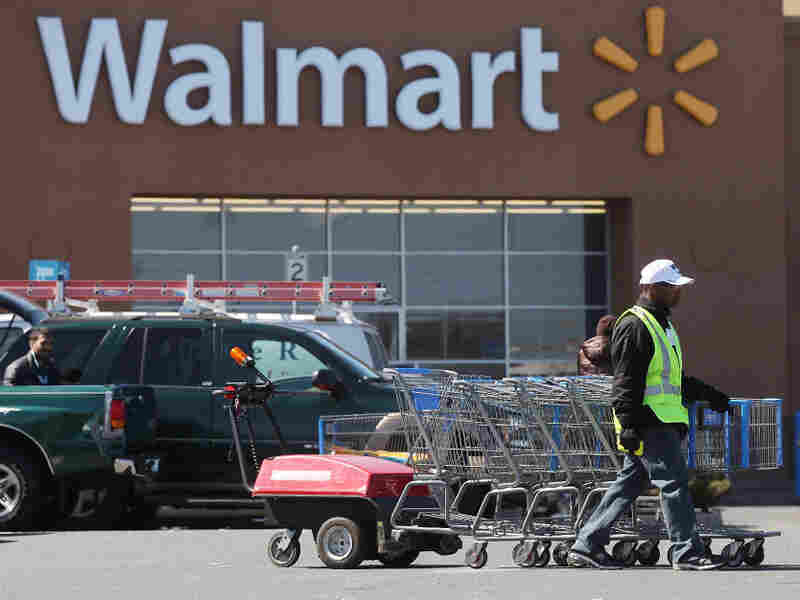 Rising Health Costs Lead Companies To Drop Part-Time Benefits : Shots - Health News Wal-Mart may be setting a new trend by slashing health care for part-time workers. ATC host Robert Siegel chatted with John Rother, president of the National Coalition on Health Care, about the issue. A man pushes carriages outside a Walmart store in Valley Stream, N.Y., early this year. The company is scaling back on health benefits for part-time workers. Wal-Mart's recent decision to cut benefits for new, part-time employees may be part of a trend, as companies grapple with higher health costs. That's the view of John Rother, the new president of the nonpartisan National Coalition on Health Care, who chatted with All Things Considered host Robert Siegel about the country's growing pack of part-time workers and why companies are rolling back their benefits. "We're seeing health costs becoming a larger and larger expense item for companies," Rother told Siegel. And that poses a particular problem for firms "engaged in international trade, where they're competing against companies that do not have to bear that expense." "Because they're in countries where the government probably bears that expense," Siegel said. "Exactly, which is mostly all other countries," Rother said. With full health coverage costing about $15,000 a year for a family, it's not economic for many employers to cover their part-time employees, he said. And there's no government provision requiring employers to pay a penalty if they don't. Rother blamed the fee-for-service model for the spike in health costs. "[It] encourages more and more care even when it's not necessary or even sometimes when it's not productive," he said. Many employers are feeling overwhelmed, according to Rother. Costs went up about 9 percent last year, and in these times revenues often don't keep up. Employees didn't see a 9 percent pay increase either. "Health costs are taking a bigger and bigger bite out of both take-home pay and the employers' cash flow," he said. So what are the options for part-time workers without insurance? "I don't mean to be flip, but your best option would be to marry somebody who has good health coverage," he said. "Because if you don't, there are very few options. Under the Health Reform Act, you will be able to get affordable coverage, but that's not until 2014."